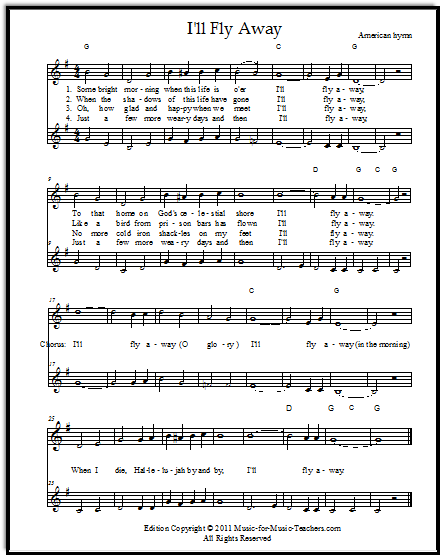 Free vocal sheet music, because it's almost sure to happen -- if you teach piano, guitar, or sing yourself, eventually someone will ask if you will teach their child voice. If you ever relent and take on a student, people will never stop asking! And then you are going to need some music. 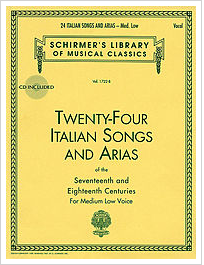 You'll find plenty of songs on this site to keep your singers busy! Most of these songs, below, feature piano accompaniments of varying levels. A Scottish love song which a young boy can carry off - very beautiful. An old Welsh song with elegant words and melody. Yes, people will want voice lessons for their children. And that's a good thing...unless you feel unprepared. But in a small town where one, two, or three piano teachers may be the only live culture going, it is worth it to go out on a limb! You can learn how to teach beginning voice (while you improve your own technique, of course). You'll certainly need vocal books and the audio examples which can, fortunately, be found on YouTube these days, but you can get started without them if you have free vocal sheet music. The beautiful Bach/Gounod composition, with Latin and also English lyrics! A dramatic song from the English Renaissance with clever, literary references. This EASY-to-sing melody has silly words that are fun and predictable, making it easy to learn even for young students who have trouble matching pitch. A genuine American cowboy song, with a surprisingly pretty tune. A vocal duet is also included on this page! Once thought to be composed by Mozart, this sweet lullaby sounds elegant when nicely sung. I first heard this lovely song in the movie "Emma," sung beautifully in German by Jane Fairfax. If you have sung in a good choir, taken vocal lessons yourself, continue to listen to good singing, and have the discipline to keep improving your own voice, then teaching voice is something you can do! For a young beginner, voice lessons are exciting, and also perhaps a little scary. Even for an older beginner, voice lessons mean putting the ego on the line. There may be a lot of just-above-a-whisper singing at first... the very opposite of the heartiness that a singer needs to throw into their part? In fact, even older beginners such as adults can be VERY shy. Their lips may tremble and their hearts pound when they first start singing with you. A pretty and well-known old English song with words by William Butler Yeats. Of course, it's about love. A fun minor melody with lots of repetition (good for beginning voice students) and lyrics that speak of an older time when mules pulled heavy loads on barges along waterways... a favorite with kids who know it! Boys will happily sing this song. But that's okay -- they signed up for voice lessons for a reason. They love music, and they want to know how to make music more effectively. The louder I sing, the louder they will sing. I let them know that I think they are very brave to sing in front of me, or anyone, and I tell them that not many people have that kind of courage! A light, pretty, fast-moving English song (that SOUNDS English!) that will help your young singers understand breathing for singing. A nice feature of this song is how EASY the piano accompaniment is! When I hear off-key notes or other funny sounds the first lesson, I never, ever pounce,or act like something is wrong. They need to get to know me and trust me, and to trust that I believe they have the ability to sing. People can develop a lot of funny habits when they sing, and they rarely hear themselves. Sometimes the habits are visual -- they pull their mouth sideways a little (very common) or raise their eyebrows with tension. Little by little -- not all at once -- you can point out corrections they need to make. Perhaps my favorite sad song... a story of a British Redcoat and the young woman he cannot marry. The famous song that everyone knows. Once, it was known as "Good Morning to You!" Like so much of this Norwegian composer's music, this is a happy-sounding song! It speaks of being content to dwell by the sea with one's beloved. Pretty intervals that make one say, "That sounds like Grieg!" It's best to think in a holistic manner about singing; instead of trying to fix every little thing you notice, try to promote healthy and good habits. When they learn what to listen for,they will start correcting themselves more and more. And they will start to notice the technique of other singers, too. "Wow, you could sure hear her take a breath," or, "She really drops her jaw when she goes up high." I Dreamt That I Dwelt in Marble Halls, from "The Bohemian Girl"
Sung by a young "princess" kidnapped and brought up among the gypsies, this song is very pretty! A plaintive, lovely song about missing the lover who has gone off to war, and determining to follow and find him. MUCH opportunity for working on expression. Primarily, as a vocal teacher, you want to be like a doctor: "First, do no harm!" Don't let your students shout like Annie singing "Tomorrow." If you don't understand "belting," stay away from it. Don't force young voices to sing loudly -- volume will come by-and-by, with confidence and an understanding of focus. These courtly lyrics were written a few years ago to go with this Irish melody by a young man who is a VISITOR to this site. Used as a pivotal moment in the most recent Cinderella movie (with Lily James), this sweet song with the "Cinderella song lyrics" has only 6 pitches, making it perfect for a beginning singer. If they don't already have a natural-sounding vibrato in their voice, don't worry about encouraging vibrato until they have good habits in hand. What do I mean, good habits? Well, take the case of Miss Prima Donna. This may bring a tear to your eye. I've included the original words about the beloved one returning from battle - but by the wrong road. Several keys are available here. Such a beautiful old song... and sad. Occasionally you will start a singer who has been imitating pop stars all her young life. For years, perhaps, people have been fawning over her, saying nice things about her voice. She has really come for lessons not to learn vocal basics, but for the opportunity to show off her style at recitals and other venues. She sees you not really as her teacher, but as her booking agent. And she may have real talent, and a very appealing voice! A brisk, energetic Scottish tune with cute lyrics about preparing for a wedding. Lots of fun, and helpfully for young singers, there is much repetition. No piano accompaniment for this song yet, but if someone begs me, it could happen sooner. But this girl may have cultivated an uncontrolled vibrato that will keep her from blending well in choral groups. She probably scoops and dips with her voice, and is apparently unable to meet a note head-on without sliding up to it. She may want to wiggle her body instead of standing in a relaxed but poised posture. Yes! I have seen it! This free piano music helps fill the gap between the beginning and the end of Matchmaker, and gives an opportunity for some theatrics! It is your job to break her of all those bad habits and teach her simple, basic classical style. That will almost certainly sound like NO FUN to this girl. Assure her that she can always pick up those different styles of singing, whether gospel,rock, or country, later! First she needs to learn to really hear herself and know what a straight style is. A French song about the briefness of life and love - very understated, slow and elegant, with some passion as well. A guitar accompaniment would make a performance extra riveting. She, along with all students, needs to learn these basics of Singing 101, and she won't get these basics by singing along with her iPod (kids' and even adults' preferred warm-up and practice approach). An Irish song about love for one's country, going to battle with a harp and sword. This old song has a gorgeous melody. I make it my mission to find for students music they will love, but I make the exception when they ask for rock music. "Very hard," I tell both voice and piano students. 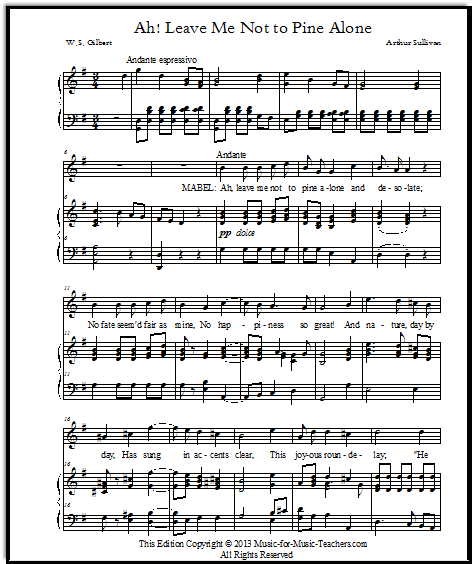 Modern Major-General, from "The Pirates of Penzance"
Brisk & amusing, this comical tune from Gilbert & Sullivan tests one's ability to articulate words very quickly. What I really mean is, "A waste of time for both of us, right now, at this stage in your singing/playing." Not that they can't learn plenty by imitation -- they certainly can and should -- but that is not why they should be at your music studio. And I don't WANT them imitating rock singers, at least not in every song! I tell them that we will be looking at that style of music BY AND BY. This is a sad story about a young girl shot accidentally by her own sweetheart, a hunter. The range is just over an octave, and the tune is irresistible. Because it is a folk tune, every verse the fitting of the lyric's syllables are a bit different. Good practice! 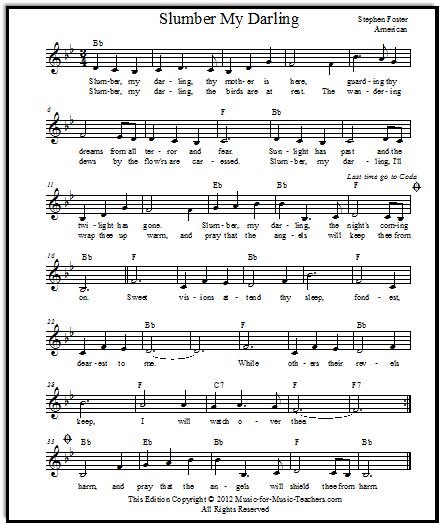 A beautiful old melody made famous by Cat Stevens. JUST the melody and the chords - I have not written out a piano arrangement for this song yet. Sorry, no lyrics are given, as they are still under copyright, but you will be able to find them on the internet. Many of my voice students began music instruction with private piano lessons, or with a band instrument at school. 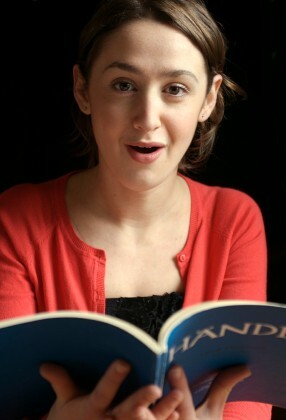 What a huge advantage for them -- note-reading ability is of great benefit to singers. "Well, that's obvious," I can hear you saying. "OF COURSE any musician should be a notereader!" A frequent choice of college music teachers for their newer students, this pretty, short classical piece will involve lessons in breathing, Italian pronunciation, and crescendo. With several different accompaniments, and variations on the melody. But all musicians are NOT notereaders. And some of them don't care! They will happily plug themselves into their iPod or phone, or sit at music lessons and listen to you, the teacher, repeat a song section over and over again until they "get" it. O Mio Babbino, from the opera "Gianni Schicchi"
A very short aria, this soaring melody is so beautiful that it is frequently attempted by 9-year-olds (whom you will find on YouTube)! Please don't let that happen at your studio, unless you use one of my simplified, lowered arrangements! 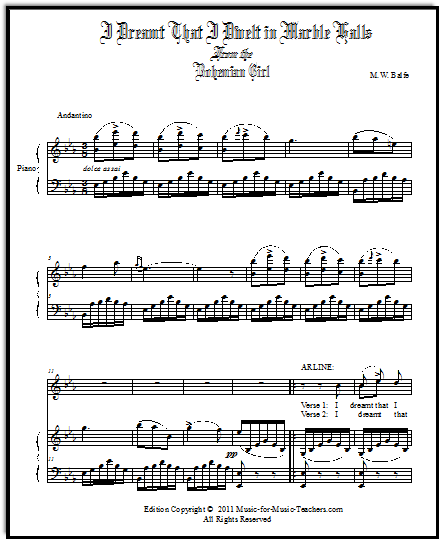 Pictured here is page one of the EASIEST of my four arrangements. Singers in particular are notorious for this lackadaisacal attitude. Sometimes a person will be blessed with a beautiful or interesting voice, but have no interest in the work required to DO something with his or her talent. Count out the rhythm of a song or choir part without someone's help. Read the notes of a song or choral part. Notice the repeats, the "D.C. al fine"s, etc. Interpret musical phrases, figuring out where to breathe, and how to make the song expressive. Read enough of the pianist's part -- the accompaniment -- so that they can count and make their entrances correctly! 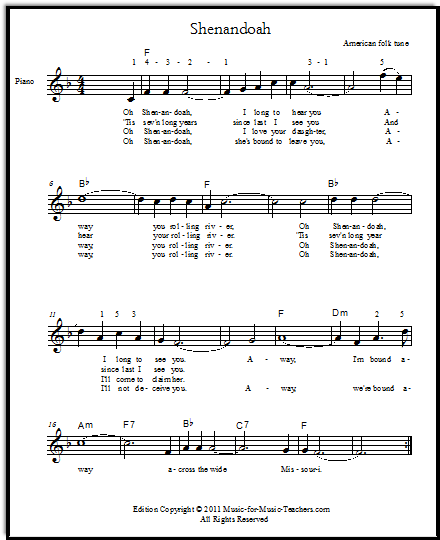 A very popular Irish melody about saying goodbye. You will find many versions of this poignant and lovely song. I tell my voice students that if they can't read music, they will be a DRAG on any group of which they are a part. That if they CAN read and interpret music intelligently, their future choir directors will bless them for it, and come to rely upon them as an important member of the group. A lovely, familiar minor song from England that every singer should know. This is a very simple accompaniment. As a vocal teacher, you need to keep your own voice in shape so you can constantly demonstrate techniques and ways of using the voice. That means you will need to be singing a little bit every day. Maybe you even want a course on singing for yourself to give you the confidence to teach others. A different kind of love-story-gone-wrong. Be cautious in your choice of music for your singers. As I say on my "Song to the Moon" page, it is best to avoid opera music if you are not a voice specialist. There is too much opportunity to damage young voices. This is a wonderful song you may have sung in high school! It is genuinely American, with somewhat puzzling but intriguing lyrics, but great scope for young voices. This is a lead sheet - no piano accompaniment yet! 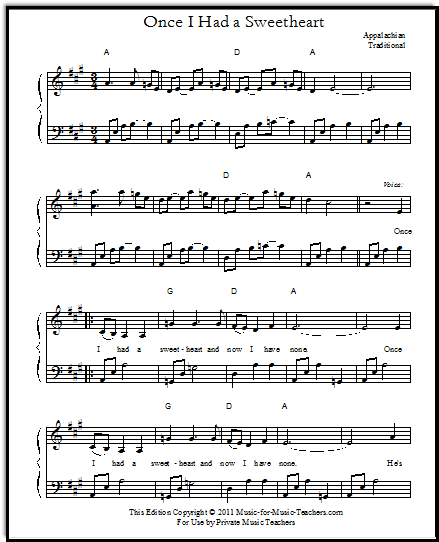 This one is just a lead sheet. From Scotland, this rhythmic song tells of the escape of Bonnie Prince Charlie over the sea after a great & terrible battle. Discover Your Voice: How to Develop Healthy Voice Habits by Oren Brown. He was a teacher at Julliard School of Music. The book comes with a CD, but may be quite expensive -- I paid over $60 for it, several years ago. A lullaby, not public domain, but too beautiful not to mention. 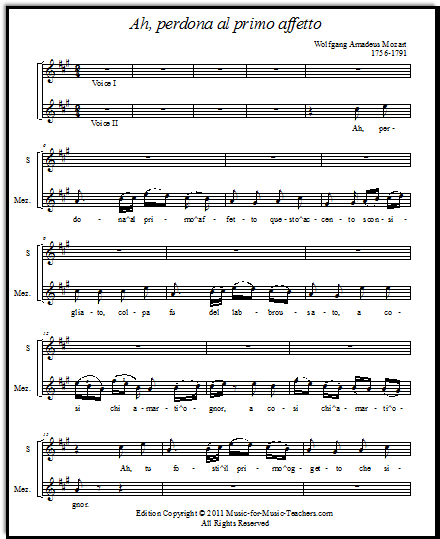 Listen to the videos and either order the choral arrangement, or go searching for a downloadable solo PDF. "The Diagnosis and Correction of Vocal Faults: A Manual for Teachers of Singing and for Choir Directors (with accompanying CD of sample vocal faults)" by James C. McKinney was also not cheap -- over $25 -- but it is very worthwhile. 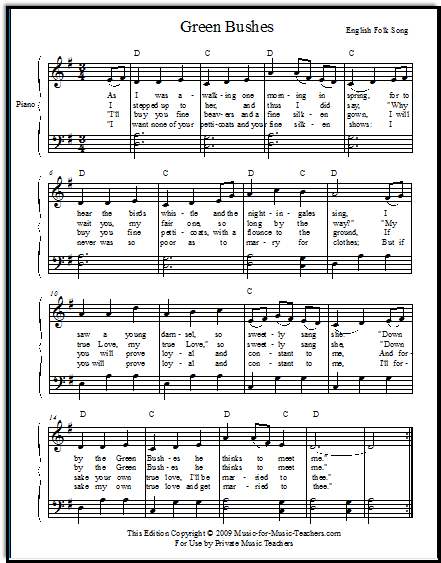 Another lullaby, this one by Stephen Foster, an American composer of the 1800's. Very nice as a young girl's first recital song. This one is a lead sheet. Perhaps the most famous piece from Grieg's Peer Gynt Suite. This beautiful song is offered in both English & Norwegian, and in several keys. How to Sing by Graham Hewitt is a slim book, right to the point, with lots of exercises. It gives a good overview, and is inexpensive. The Rock-N-Roll Singer's Survival Manual by Mark Baxter was an interesting read. I bought it with a video of the same name. I was floored by how relaxed Mark Baxter's singing voice sounded. His business is helping people who scream for a living -- rock singers -- get up every day and do it all over again without permanent damage to their voices. He has a DVD by now, which can be found, along with a Q and A forum and lots of good advice, on his website, VoiceLesson.com. This appeal to the moon is a song sung by a mermaid who is struck with love for a human. From the opera "Rusalka", this aria is amazingly serene and beautiful, and NOT for young girls (unless you let them sing it in one of the lower keys that I provide here!). An old English sea chantey, saying "Farewell, and adieu!" Boys like this song too. It's very fun with guitar backup. An energetic romp of an Irish song! There is some vocal harmony in this song. This fun Irish tune practically sings itself! High-energy; kids really like it. This is an old and beautiful minor song from Elizabethan or older times, with an interesting story about a knight, "slain 'neath his shield." The ravens are sitting in a tree, discussing him and the companions who cling faithfully to his side. I have placed all the lyrics on page two of this song. "A secret tear" is the meaning of this song's title. From an opera by Donizetti, this male aria has many soaring phrases, room for expression, and a cadenza. In a minor key, you might think the lyrics were sad if you didn't translate them. Actually, the singer is overjoyed! There are some older CDs and DVDs, books and VHSes available from a couple named "Beatty" whose company is called "The Vocal Coach." They have many products, and it looks like some of them might be hard to find, but still available -- I found mine new in a homeschool catalog called "Rainbow Resource." "Come, come, o my delight!" Another minor piece, slow and lovely, offered in several keys. This song has a stately feel about it, with a slow crescendo. Amazon lists quite a few of them, such as Maximum Vocal Performance. One of their CDs about breathing exercises has been very useful to me, and I continue to use some of the exercises. Voi che sapete, from "The Marriage of Figaro"
This is a charming aria by Mozart! "You who know, tell me why suddenly I am hot, then freezing cold?" The fire and ice in his blood can only be explained by the awakening of love - or at least, his dawning awareness that females are more interesting than he had known! For sopranos. This song from Australia can be sung by boys or girls... luckily, because it is a great favorite, with its lovely melody and its word pictures of billabongs, coolibah trees, jumbucks, and more! With tabs for guitar players. Another one I like is Singing for Dummies. Yes! There's a lot of information that is obvious in it, as must be the case with all beginning manuals, but there is also much that is very insightful, and advice stated in ways I haven't run across elsewhere. The Water is Wide - easy guitar songs! Such a pretty song, which you may have sung yourself in high school. Lovely old-fashioned lyrics, about love betrayed. 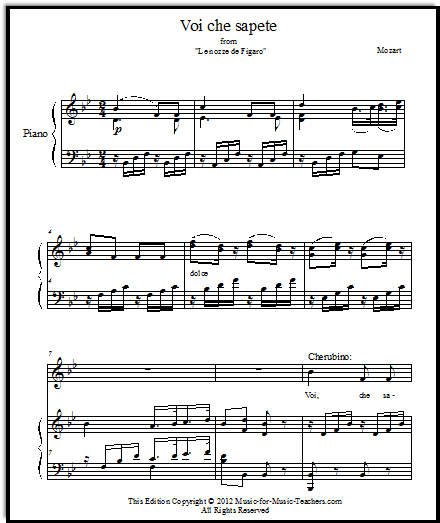 So far, this is only a lead sheet or beginner piano sheet. Words and images are the necessary tools of a voice teacher. And different words will get concepts across to different singers. After all, you can't say, "Press this key and you will hear an 'A.' Pluck these strings and there is your chord." Instead, the body is the instrument. A song with imitative phrases that build upon each other with a slightly larger interval each time - good for developing aural accuracy! Additionally, it is the kind of piece with lyrics that make for good articulation practice. Oh, and it's PRETTY too! This is an excellent first semi-classical song for a beginning singer. So, vocal teachers rely on images and words to get their singers' muscles working the right way. Kids love this song about a brave Irish girl who defies a British soldier who wants to take her banner - her Irish flag - away from her. I love it too, and am always glad when a new student starts this song. There are multiple opportunities for working on phrase elongation, crescendo, and even an Irish accent if it strikes your fancy. What's wonderful is that the melody is lovely, too! "'Spin' the tone; imagine an orange spinning just beyond your forehead..."
And much WEIRDER things than that! Teachers seek to manipulate sound as if it has the kind of physical substance you can touch. 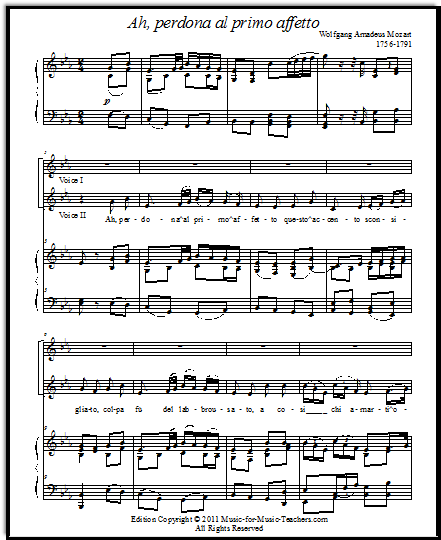 Wiegenlied is the "Cradle Song" above; the melody is simple but satisfying. The lyrics are in German, but I have some suggested English translations on the page. Once thought to have been written by Mozart. This cute German song was made famous in the United States when Elvis Presley sang it to the words "I don't have a wood - en heart..."
Check out the easy harmony for two singers! A pretty round with a reach of an octave, slow-moving notes, and easy intervals. The scale-wise movement makes this song easy for a beginner. With lyrics from an older time, this is more difficult than many rounds, but compensatingly more beautiful, with more complex harmonies as well! Christmas rounds to sing "Christ is Born"
Lots of big interval jumps, even octaves, make this round fun and tricky. Originally from Germany (Kaffee), this is great fun to sing! Prayer for Thanksgiving: "For Health & Strength & Daily Bread"
Pretty, and fairly easy, as it moves primarily in descending steps, this is a wonderful Thanksgiving song! Haida is vigorous and fun - there are two spots that invite a clap, adding to the rhythmic feeling of this song. This brisk but pretty round from England compares a deer to a rabbit, and a man to a woman! An unbelievably pretty round, with lyrics that DO NOT do it justice! Make up your own, or have fun singing "oooooo" to the original lyrics, or try the Latin lyrics I sometimes use. The first round I use with beginning singers. Another brisk Hebrew round, lovely and minor. A song about peace, from Israel. Frederick and Mabel sing this gorgeous duet from Gilbert and Sullivan's "The Pirates of Penzance". The song begins dolefully (though beautifully), but ends with a bang! 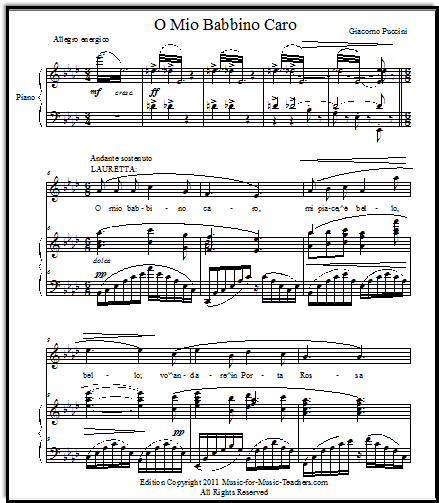 The full 7-page duet, from "La clemenza de Tito". A duet version of this lovely cowboy song, for male or female voices, or both! This is short - just one verse. 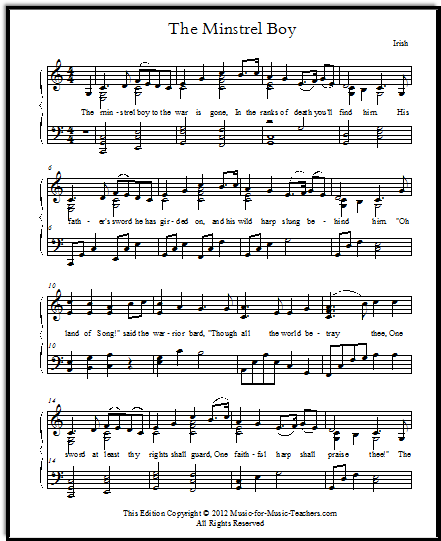 A very pretty Shape Note Hymn which talks about heaven, and how "it is better, farther on." Very comforting lyrics, suitable for a funeral or memorial service for a Christian. A young noblewoman of India shares her secret with her maid - love for an English officer- in what becomes a most lovely duet that sounds like birdsong. Try this abbreviated version of the opera duet with a group of young girls - it will be one of the highlights of their early musical years. This is the full opera duet, offered in two keys! One is the original key, and one is lowered a third, to make this melody accessible for high school girls. Lovely enough for a wedding! Gabriel's Message - "The Angel Gabriel"
"'To me, be as it pleaseth God,' she said." Very lovely, and almost UNKNOWN. 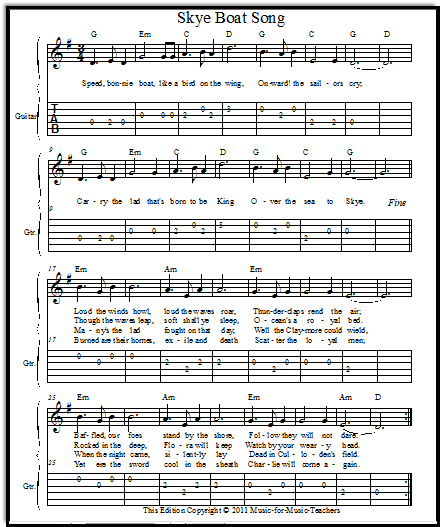 A lively gospel hymn about heading to heaven. This works well for voice or instruments. 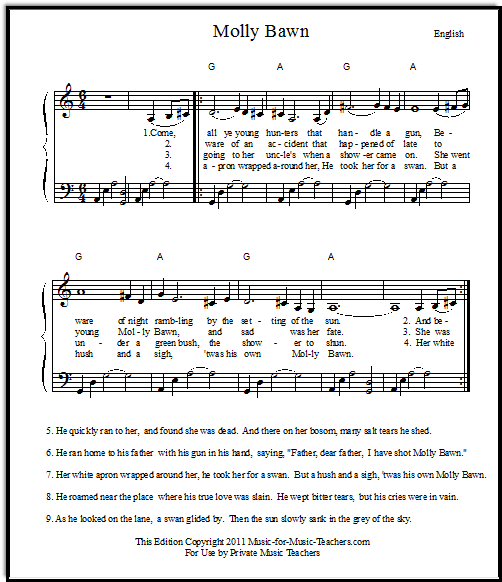 From "Fiddler on the Roof" - this can be added to your students' recital performance of Matchmaker - a free download! This music is original, written by me, not part of the copyrighted musical. Therefore you can use it free of charge! 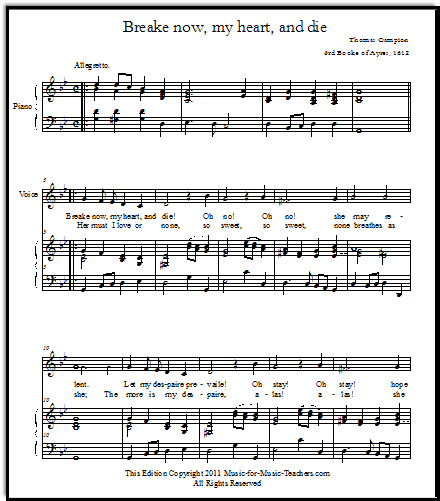 Oh false one, from "The Pirates of Penzance"
The famous beautiful Christmas song. This duet is not hard. A sea chanty with a swing in it! It is fun to sing, for boys too. An Irish song with energy. Very fun, with a pretty harmony. You probably don't know this melody! This has the sound of a shape-note song. Unusual and moving. This is a German folk song made popular by Elvis, with new English lyrics. The harmony is very easy! With a strong minor melody, this is a Christmas carol that is beautiful but little-known. Now with a lovely piano accompaniment. 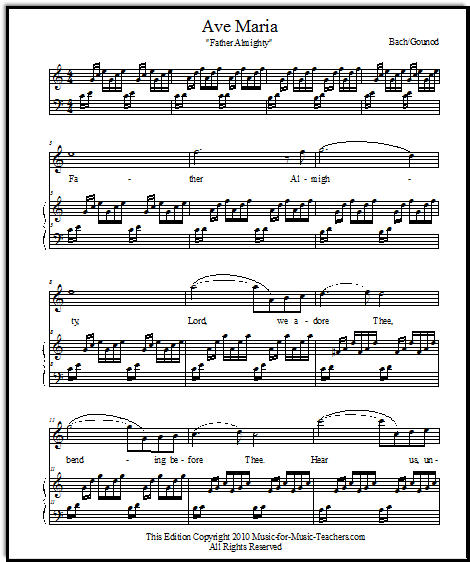 The well-known anthem which is also known as "God Save Our Noble Queen"
This is "O beautiful for spacious skies..."
In six different keys, this carol is a great favorite because of the "Gloria" section which is so fun to sing! A sweet, familiar carol children love. A very old hymn, with a strong melody. A short and cheerful carol, with a mixture of English and Latin words. An energetic and pretty Christmas carol, with a lovely "Glo-o-o-o-o-o-ri-a" chorus. "Praise God from whom all blessings flow..."
A pretty Shapenote hymn, very old-fashioned, with comforting lyrics. A good hymn for Thanksgiving. Not many people will disagree these lyrics, I think! In this carol, the creatures in the barn each sing of their role in the Christ Child's story. The angel Gabriel appears to Mary the mother of Jesus. A haunting melody. With lyrics in Latin, this is an unusual, medieval-sounding carol. 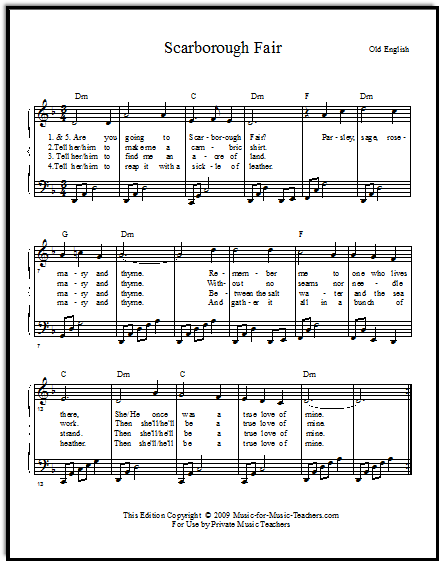 The famous old English carol, commonly featured as a backdrop in British Christmas movies. A good song to lighten the heart at funerals, when you are certain of your eternal destination. An energetic, fun, and pretty old English carol. "The holly bears a berry as red as any blood, and Mary bore sweet Jesus Christ to do poor sinners good." "Mary pondered greatly all the things the shepherds had said, Watching close her baby in his manger bed. 'Here asleep, the Son of God, and the son of man. Heav'n and earth within him stand - Alleluia!' "
My father was a Marine in the Korean War who was awarded the Silver Star. He never liked to talk about it, but he loved singing this song. A song of hospitality and feasts, with difficult but intriguing lyrics! With several new arrangements. SO BEAUTIFUL... this song evokes the mood of Christmas. 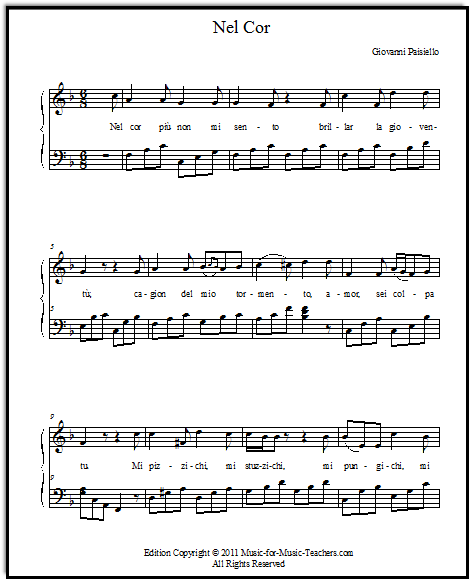 With a free vocal duet at the bottom of the page. A very pretty and short carol. This can be a very easy duet. Cute lyrics - "Willie, take your little drum - Robin, bring your fife and come!" A driving energy. A carol from France, unfamiliar but haunting. An old hymn; "Softly and tenderly, Jesus is calling... calling for you, and for me." The national anthem of the United States. This is a song about Santa and his reindeer up on the roof. A beautiful Christmas carol with a feeling of mystery and lands far away. 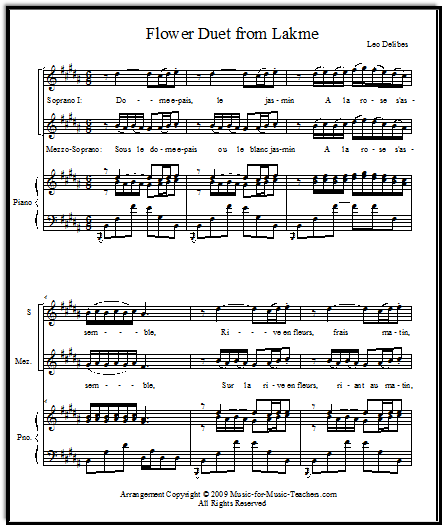 Several arrangements, including a very playable vigorous arrangement suitable for crowd singing and not very hard. One of the prettiest carols ever, and with stirring lyrics. Very descriptive, telling the story of Jesus' birth. Don't miss this beautiful hymn. "What wondrous love is this that caused the Lord of Bliss to bear the dreadful curse for my soul?" A different melody altogether than the commonly known version. A bluegrass or even Shapenote feeling. A song about how God treasures little children. "All His jewels, precious jewels, His loved and His own." 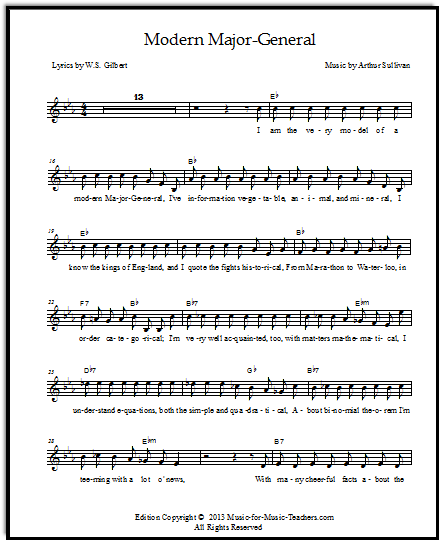 Go here to see all the lead sheets at Music-for-Music-Teachers, for vocalists and all instruments! How to Teach Beginning Singers - If You are a Beginner, Too! Staff Paper PDFs - all shapes & sizes! All the voice books mentioned above bear re-reading; they are almost like holding a conversation with a master vocal teacher. And be sure to check out the many tiny (and frequently contradictory) vocal lessons offered all over Youtube; comparing them can be very instructive. Listen to opera singers. In future pages, I will share more about starting voice students, and how they can be a very fun addition to your music studio. Recitals are much more interesting when you can mix things up, alternating piano with voice, and maybe guitar. Young girls, and some boys, just love to sing! 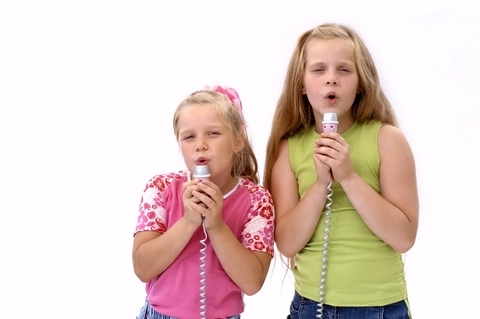 Voice lessons might be their dream, and you might be the answer to it! AND you are willing to educate yourself in your weak areas, then you will be doing your community a wonderful service by taking on voice students. 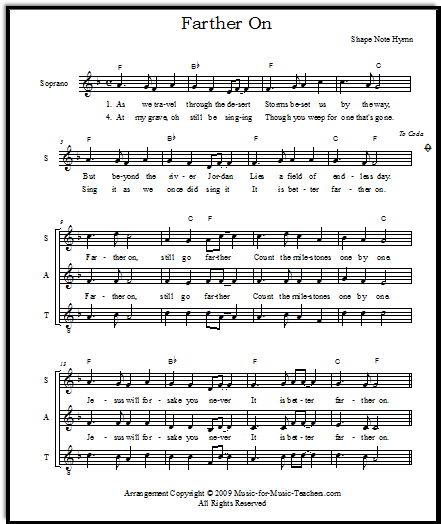 Avail yourself of the free vocal sheet music offered here, and you will be off to a head start. People love to sing! If you can help them learn, you will make your community a more beautiful place to live. ... I watched your video "Wondrous Love" with your eight gals - Magnificent! So refreshing to see good harmonies sung a capella these days; it seems to be rare! Thanks, Dana, for your excellent customer service. Thank you! THANK YOU!!! For keeping the beautiful art of Opera alive! I stumbled upon this site and I'm so happy I did! 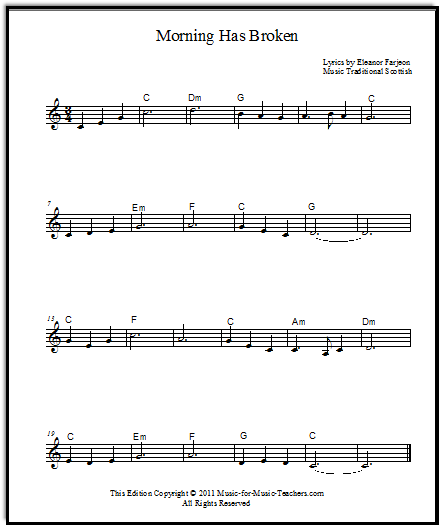 I just wanted to say thank you so very much for your free printable sheet music. I am a piano teacher from the UK who has recently moved to a very remote location in Australia!